Following is an overview of all-new vehicles that were unveiled at various auto shows during the winter of 2018 that are either on the verge of going on sale or scheduled to be in showrooms by the end of the year. A sign of our crossover-mad times, fully nine of the 21 vehicles covered in this preview classify as crossovers. In addition to the Kia Forte which will be offered in sedan and hatchback formats, there are three conventional sedans, an old-school station wagon, three hatchbacks and three three all-new pickup trucks (four if you count GM's Silverado and Sierra separately) that will be on sale before 2019 arrives. All-new fifth-generation Forester goes on sale in the fall of 2019. For the new Forester, Subaru opts once again for a gentle evolution of style rather than a noticeable break with the model it replaces. Underpinning the new vehicle is the Subaru Global Architecture, which supports the Impreza/Crosstrek and Ascent, and will eventually be Subaru's sole platform. Cabin styling is very traditional, with big, crisply marked gauges and simple, straightforward controls. Seating is comfortable front and rear a 27 mm (one inch) longer wheelbase of the new model results in greater rear seat legroom. The 2.5L flat four returns for 2019, now with direct injection and a stop/start system. Power increases from 170 to 182 for 2019 and Subaru touts gains in performance and fuel economy for the updated powerplant. 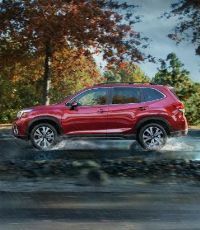 The 2L turbocharged engine has been discontinued for 2019 but Subaru's new 2.4L turbo, which debuted on the recent Ascent, may find its way under the hood of the Forester eventually. All-wheel drive is standard and power reaches the wheels via a revised CVT which now offers a seven-speed manual mode. SI Drive, with Intelligent and Sport settings, is standard. An optional drive mode permits the driver to select Snow/Dirt and Deep Snow/Mud settings. 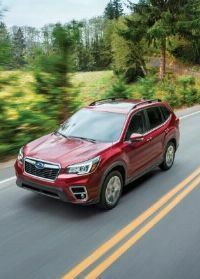 Subaru's optional EyeSight collision avoidance technology is joined by a lead vehicle alert that signals the Forester driver if that driver has not noticed that the car in front of it has started moving. No pricing details are available at this time. New vehicle, not rated. Suburu insists its traditional engine issues, leaking head gaskets and excess oil consumption, are in the past. If you plan to keep the car past the five year/100,000 kilometre powertrain warranty, an extended powertrain warranty might be good insurance. Toyota takes one more kick at the Avalon can despite extreme indifference from the buying public. Despite no interest from the public--444 sold in Canada in 2017--Toyota has elected to release the fifth-generation Avalon in Canada for the 2019 model year. 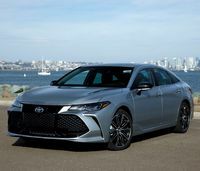 With its massive grille, jagged forms flanking the grille and heavily creased side profile, the new Avalon lacks the sublime elegance of its predecessor. The new Avalon is yet another new model built on the Toyota New Generation Architecture that now underpins virtually all of Toyota's newest models. Toyota has elected to open up some marketing and literally actual space between the Camry and the Avalon for the new model. Compared with the Camry, the Avalon is built on a 50 mm (two inch) longer wheelbase, which makes for great legroom for rear seat riders. Toyota has pulled out all the stops when designing the cabin of the new Avalon, which is modern and luxurious. The driver faces large traditional gauges separated by a substantial info screen. The centre of the dashboard is dominated by a large rearward angled screen that flows into the centre console. The visual element of the screen is flanked on each side by four pushbuttons; with a control knob at each lower extremity of the screen. The climate is controlled by a series of buttons that look complicated at first but prove simple to use. From the gothic window sew patterns on the seats and fascinating shapes, the cabin of the new Avalon is distinctive and luxurious and a big step up from what came before. The sporty themed XSE trim features alloy trim and vinyl and faux suede seating with the Limited reflecting a traditional luxury vibe with leather seating and genuine wood accents. The Avalon is powered by a re-engineered by a 3.5L V6 which puts out 301 horsepower but only 267 lb-ft. of torque. Power flows to the front wheels exclusively through an eight-speed automatic transmission. The Toyota Safety System, with pre-collision including pedestrian detection, daytime cyclist detection, dynamic radar cruise control and lane departure alert with steering assist, are standard. Also standard is blind spot and rear cross traffic monitors, with the Limited adding a rear self-braking feature to the rear cross traffic feature. 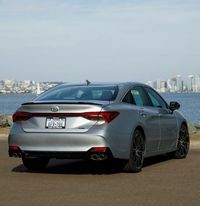 New to the Avalon but long a factor of Camry marketing, the new Avalon will be offered in two streams, the sporty XSE and the more traditional Limited trim. The vinyl and faux suede upholstered XSE tirm starts at $42,790. The $47,790 MSRP Limited, with luxury items such as a power adustable heated steering wheel, heated rear seats, ambient lighting, memory seats and leather seating, is good value and your only choice if you want to avoid vinyl upholstery. New vehicle, not rated. Previous Avalons have been reliable. Active Safety Features: Pre-collision with pedestrian detection, dynamic radar cruise control and lane departure alert with steering assist as well as blind spot and rear cross traffic warnings. An all-new Corolla Hatchback goes on sale in the fall of 2018. 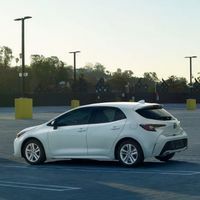 Unlike the previous Corolla, which was a sleek and modern design, the new car, with a dramatic and fussy front end and generally lumpy styling, looks frumpy and older than the car it replaces. Toyota debuted the hatchback version (which will replace the Corolla iM) at the New York show but a sedan, which will be the volume seller in the U.S. at least, will surely follow. Contrasting with the lacklustre exterior, the cabin, with clear dials, a large infotainment screen, interesting shapes, high contrast two-tone colour combinations and plush materials, is very stylish. Despite a longer wheelbase, the roominess of the last Corolla seems to have evaporated and rear seat legroom lags behind other cars in its class. 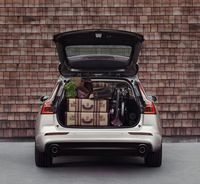 The hatchback model boasts a spacious and versatile cargo hold. Apple CarPlay finds its way into the Corolla for 2019. Like its C-HR, Prius and Camry showroom mates, the new Corolla is based on the Toyota New Generation Architecture (TNGA). A new 2L four, called Dynamic Force, is found under the hood. Power reaches the front wheels via either a six-speed manual transmission or a CVT. The second-generation of Toyota's Safety Sense System, called TSS 2.0, will be standard. It features a pre-collision system with pedestrian detection and daytime cyclist detection, dynamic radar cruise control and forward collision warning with autonomous emergency braking, lane departure warning with steering assist as well as a blind spot warning system. At just under $22,000 with automatic transmission, the base Corolla S hatchback lacks only alloy wheels to suit the needs of most buyers. The SE trim, with alloy wheels, an alarm system and leather wrapped steering wheel, is priced to reflect the value of its extra equipment. The SE Upgrade trim level is significantly overpriced. The range topping XSE model is reasonable value compared with the SE Upgrade but given that the SE Upgrade is overpriced, it makes the XSE look pricey as well. New vehicle, not rated. The new engine is unproven. The previous Corollas was reliable. Active Safety Features: Pre-collision system with radar cruise control, autonomous emergency braking, pedestrian detection and daytime cyclist detection. Lane departure warning with steering assist and blind spot warning. An all-new RAV4 goes on sale in the fall of 2018. 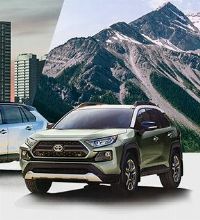 Toyota's latest "Power Force" engine series, a 2.5L four in the case of the RAV4, is the mainstream engine for all variants. Power finds its way to the wheels via a conventional eight-speed automatic transmission. The hybrid variant combines the efforts of the 2.5L four and the electric motor and sends power to the front wheels via a CVT. On all-wheel drive hybrids, the rear wheels are driven electrically. All-wheel drive models feature Multi-Terrain settings; with programming for snow, mud, sand and rocks. 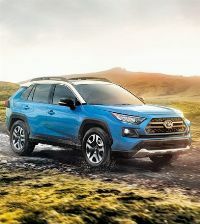 Unlike its sleek, car-like predecessor, the new RAV4 has a decidedly trucky look that bears a close resemblance to Toyota's serious off-roader, the 4Runner. With a longer wheelbase, the cabin is roomier than before. The driver faces big, clear gauges with a distinctly truck-like ambience and the climate and audio controls looks like they would be at home in one of Toyota's pickup trucks. The top centre of the dash is dominated by a large info screen, which is flanked on both sides by four push buttons, with each a control knob at each lower corner of the screen. The cabin materials look and feel better than those in the last RAV4. 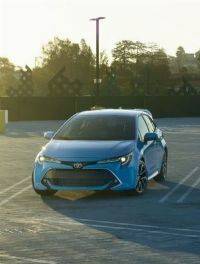 The second-generation of the Toyota Safety Sensing system, referred to as TSS 2.0, will be standard on all trim levels. New vehicle, not rated. Unproven platform, engines and automatic transmission. An all-new V60 debuted at the New York show in March 2018 and will go on sale this fall. Volvo's new V60 broke cover at the Press Days of the New York show this year. Like the XC90, S-V90 and XC60, the new V60 is built on Volvo's Scalable Product Architecture and is uncommonly elegant. It appears that the recently introduced XC40 was both a rip in Volvo's style continuum and fortunately, an anomaly. The V60 will be built in Belgium but the upcoming S60 sedan will be sourced from Volvo's new U.S. factory. Volvo has become a master at repurposing various components and XC90, XC60 and S-V90 owners will be very familiar with the gauges, touch screen, audio, climate controls as well as the front seats of their new V60s. The cabin of the V60 is both a vision of restrained elegance and assembled from very attractive components. Seating is comfortable and passenger space and cargo volume are both competitive within the compact luxury segment. Volvo's Drive-E 2L fours, in turbocharged T5, turbo and supercharged T6, and eventually a plug-in hybrid offshoot of the T6 marketed as the T8. 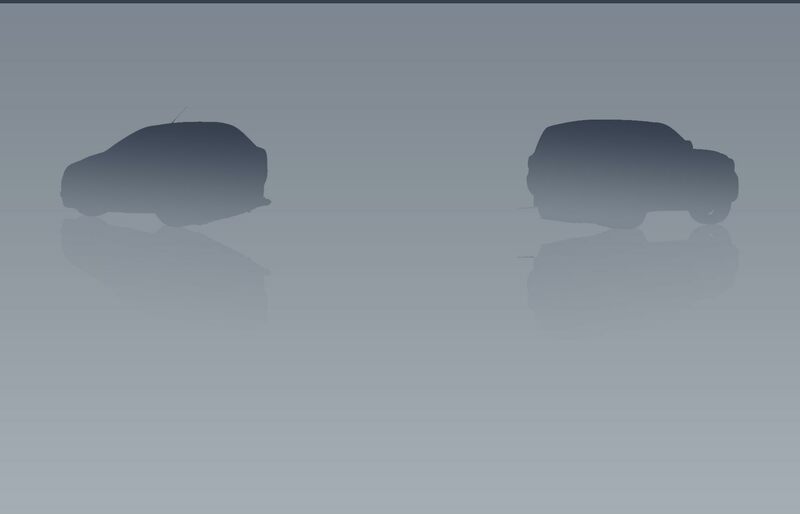 The T5 will be offered with front-wheel drive; with all-wheel drive optional on the T5 and standard on the T6 and T8 variants. A conventional eight-speed automatic is the sole transmission available. 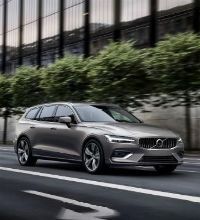 The V60 will equipped with a wide array of active safety features including City Safety system with Autobrake, autonomous emergency braking, with a detection system that can identify pedestrians, cyclists and large animals. Volvo's available Pilot Assist system adds cornering performance, road run-off mitigation and oncoming lane awareness. Volvo Canada has announced an MSRP of $44,900 for the base front-wheel drive T5 model. Volvo charges a $4000 supplement to move to the T6 engine (66 extra horsepower) and all wheel drive on the base Momentum trim. The Momentum Plus package, with hands-free tailgate operation, active headlamps with washers, navigation and fog lamps, among other things, is priced to reflect the content in the upgrade. The Vision package, with useful equipment such as self-parking, an all-around view camera, blind spot and rear cross traffic monitors, is good value. The Momentum Climate and Convenience packages look pricey. Volvo has no information as to why the Inscription trim costs $7500 more than the Momentun T6. The Inscription Vision package is good value but the Climate and Convenience packages are overpriced. New vehicle, not rated. Below average reliability is expected, especially as the car ages. The four year 80,000 kilometre powertrain warranty is typical for the European brands but the sheer complexity of the T6 and T8 engines make the coverage look inadequate. Active Safety Features: Adaptive cruise control, collision warning with full autostop, rear cross traffic detection and lane departure warnings and lane keep assist as well as City Safety system with pedestrian, cyclist and small animal recognition. The Arteon, an all-new Volkswagen range-topping passenger car that replaces the Passat CC in the VW lineup, goes on sale this fall. 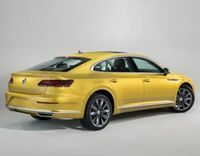 Based on Volkswagen's ubiquitous MQB platform, the Arteon is a substantial vehicle that is roughly the same size as the Passat. However, unlike the very pedestrian-looking Passat, the Arteon is, with taut forms and inspired detailing, a very elegant machine. Though it looks like a sedan, the Arteon is actually a hatchback. The Arteon's cabin will look and feel very familiar to most Volkswagen owners. The dashboard touch screen, climate and audio controls are all repurposed from other VW models and drivers of upscale trims will face the multi-configurable transistor film technology (TFT) gauge pod that has been working its way into many Volkswagen Group products over the last few years. The rest of the cabin reflects a very traditional manifestation of elegance. Seating is comfortable front and rear and legroom is generous for all occupants. The hatchback tail is both commodious and versatile. 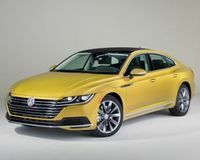 The Arteon will be powered by a high-output version of VW's 2L turbo four that produces 268 horsepower. Power reaches the wheels exclusively through a conventional hydraulic eight-speed automatic transmission. Front-wheel drive is standard; with 4Motion all-wheel drive optional. Active safety equipment like forward collision warning, autonomous emergency braking, adaptive cruise control with stop and go and lane departure with lane assist, will be available. New vehicle, not rated. The Arteon should demonstrate average reliability for the first three or four years, with reliability expected to decline after that. Active Safety Features: Active safety equipment like forward collision warning, autonomous emergency braking, adaptive cruise control with stop and go and lane departure with lane assist, will be available. 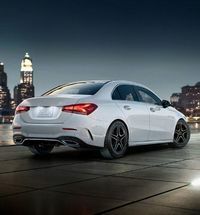 Now in its fourth generation in other markets, the Mercedes-Benz A-Class will come to Canada for the 2019 model year. The A-Class is the first vehicle of the next generation of the budget-line from Mercedes that also includes the B, CLA and GLA models. While it it is in fourth generation, the new A-Class is the first version of the vehicle to be marketed in Canada. Canada will get the hatchback and the forthcoming sedan, whereas only the sedan will be offered to U.S. buyers. Compared with the current Mercedes B-Class, the A-Class is built on a 39 mm (1.5 inch) longer wheelbase and 29 mm (1.1 inches) longer overall, presaging a larger B-Class the next time it is renewed. The new A-Class hatchback is easily identifiable as a Mercedes and benefits from being designed during one of the "elegant" periods Mercedes occasionally stumbles into. Inside, the A-Class driver faces a long and shallow tablet-like screen which has a gauge package in front of the driver and infotainment sector over the dash centre stack. The climate controls are manipulated by a succession of small buttons just below the info screen. The rest of the dash is dominated by vintage-themed circular vents. With interesting shapes and some tasteful two-tone colour combinations, the cabin looks welcoming. The iOS-Android cellphone interface will be standard on the new A-Class. The A-Class will be powered by a 2L turbo four which produces 221 horsepower, 13 more than the current B-CLA-GLA trio. Power will reach the front wheels, or optionally, all wheels, via a seven-speed dual clutch automated manual transmission exclusively. No pricing is available for the A-Class sedan. 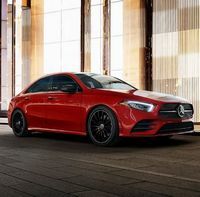 The base front-wheel drive A-Class hayon begins at 38 165$, with the AWD system, marketed as 4Matic, priced at 2 000$ The prices for the Sport, Tech and Night packages reflect the value of the content contained in the packages. Outrageous supplements for metallic paint (990 $) and leather upholstery (1 995$). Though technically under the B-Class in the Mercedes hierarchy, the A-Class starts at a very similar price and is offered with luxury features, such as leather seating, not offered on the B-Class. New vehicle, not rated. Reliability should be average for the first three or four years, deteriorating after that. The short powertrain warranty of four years/80,000 kilometres, shows a lack of faith in the long term prospects of the main mechanical elements. The regular scheduled maintenance option package available from Mercedes is highly recommended. Active Safety Features: No information available. The second-generation QX went on sale in mid-2018. 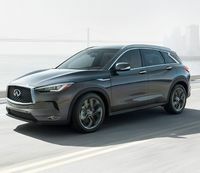 With strong acceleration and flexibility, the QX50's radical variable compression ratio turbocharged 2L four--the first in a production car--is a success. However, engine refinement when leaving from a stop and when accelerating briskly, is disappointing for a luxury vehicle. Infiniti needs to enhance sound insulation to remove the unpleasant engine noise as it could be a deal-breaker for QX50 intenders. Fuel economy of 11.3L/100km was higher than expected, especially as premium fuel is required. The sole transmission offered is a CVT mimics the stepped changes of a conventional automatic transmission unless you demand maximum acceleration, when it holds onlo a gear ratio until the driver backs off the throttle. Thje QX50's steering is touch slow to react, lacks feel, but is nicely weighted and faithfully holds its line on the highway. Despite massive 20 inch wheels on our Autograph range-topper, the QX50 smothers minor road imperfections but loses its composure when it encounters more challenging road surfaces. The QX50's suspension grips well and feels stable but lean is greater than expected. The brake pedal feels a bit soft but response is linear and stopping power is very good. With upgraded leather upholstery, ultra-suede headliner, windshield pillars, door, dash and centre console accents, convincing faux alloy accents and open-pore wood trim, the cabin of the QX50 Autograph model driven by the APA blasts past luxurious on its way to sumptuous. Few vehicles, even at this price level, can equal the sheer opulence of the QX50's cabin. The driver faces clear gauges separated by a configurable electronic readout. Shared with the Infiniti Q50, the dual screen navigation, audio and climate controls work well enough. The air-conditioning does not offer a temperature less than 18 degrees centrigrade and its performance on 30 plus degree days was found wanting. The cooled front seats work very well. The front seats are supportive and room is ample. Rear seat riders enjoy a supportive seat and good legroom. The rear seat can be moved fore and aft to maximize rear seat legroom or cargo space. Toe space under the front seats is tight. Though the glazed portion of roof is massive, the actual sunroof aperture is small. Impressive audio quality from the brand-name sound system. The trunk is long, wide and deep below the window line. 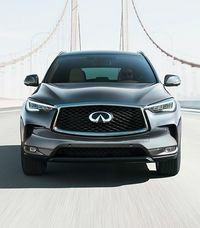 The QX50 changes focus this year; moving from a premium rear-wheel drive platform derived from a luxury sedan to mainstream front wheel drive-based underpinnings. Production moved from Japan to Mexico. big V6 found under the hood of the last QX50 has been jettisoned in favour of a powerful 2L four which Infiniti refers to as the VC-Turbo, VC standing for variable compression. The engine adjusts the compression ratio between 8:1 (for performance) and 14:1 (for fuel economy). Former Swedish carmaker Saab toyed with this idea and won several awards for the technology, but abandoned the concept after General Motors (Saab's owner at the time) cut off funds for further development. This technology is innovative but unproven and complex; potential owners may be comforted by Infinit’s six-year/110,000 kilometer powertrain warranty. The $44,490 Luxe base model does include a sunroof, forward collision and blind spot warnings as well as autonomous emergency braking, but suffers the indignity of vinyl seats. Upgrading to the Essential trim brings expected features such as leather upholstery and navigation, but is priced about $1000 too high, which holds true for the Pro-Active trim as well. In contrast, the Sensory trim upgrade is a fantastic deal and results in a comprehensively equipped and sumptuously appointed vehicle. The range-topping Autograph trim is priced to reflect the value of the equipment included in the upgrade. Very good lease value. New vehicle, not rated. The engine features unproven technology and if you plan to keep the car past the powertrain warranty, an extended powertrain warranty would be advisable. Active Safety Features: Forward collision warning with pedestrifan detection. Radar cruise control with autonomous emergency braking. Lane departure, blind spot, rear cross traffic warnings, distance control assist and steer assist.